Some of my recent haiku (from Dark Corners of the Land) will appear alongside unpublished poems by Charles Plymell, Ntozake Shange, Gerard Malanga, Fred Voss, Alan Dent, Doug Draime, Edward Lucie-Smith, Joseph Ridgwell, K.V. Skene, Joan Jobe Smith, Tim Wells, A.D. Winans, Rob Plath, and Gerald Nicosia in Counterfeit Crank. This limited edition chapbook is published by Sick Fly Publications, an imprint of Tangerine Press in May 2012. The lowdown: Handsewn at the Sick Tangerine workshop by Michael Curran. Recycled 325gsm Cairn Almond stiff card covers; front cover has large ‘Counterfeit Crank’ signature, stamped in red ink; 85gsm Fabriano Bio Prima Off-White archival quality text paper; 130gsm Hahnemuhle Grey-Blue endpapers. 50 numbered copies available for sale. The first 25 copies in the edition include a tipped in, signed broadside poem by Joseph Ridgwell. 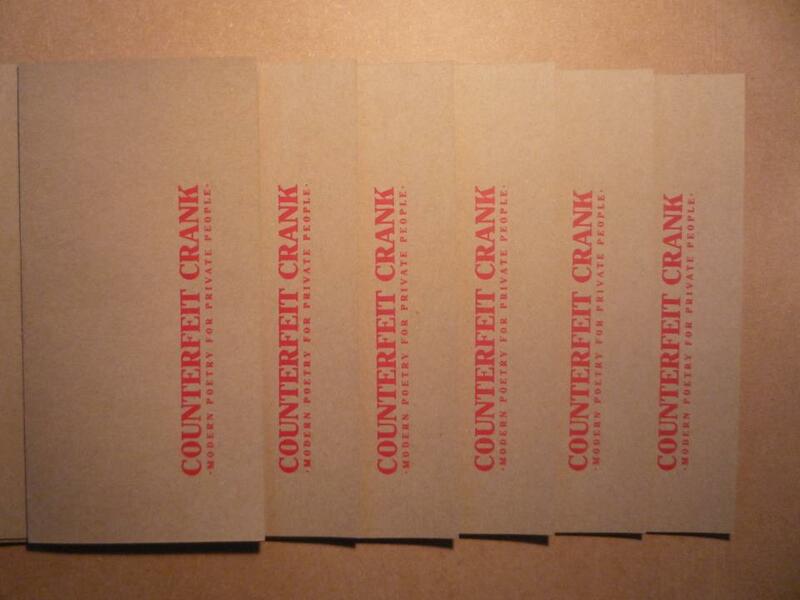 Counterfeit Crank is a one-off chapbook journal, never to be reprinted or repeated. Available for pre-order via this link.